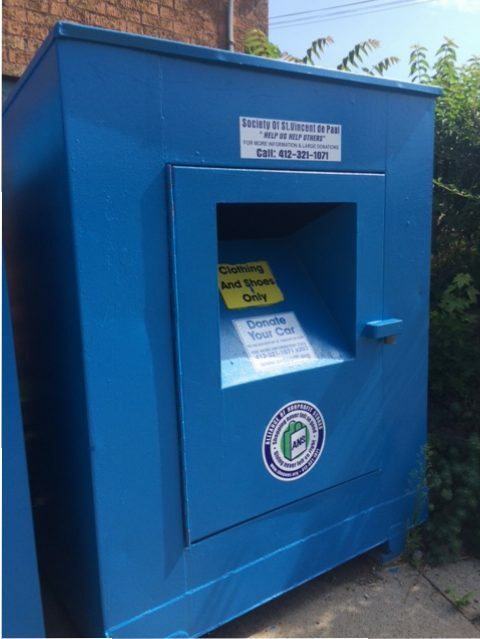 Donate your gently used clothes and shoes at any of our blue St. Vincent de Paul donation boxes located throughout the Pittsburgh area. Donation boxes only accept clothes and shoes; please do not place household items (such as glassware, pots, pans, or knick-knacks) or furniture inside or around the boxes. You can donate household items and furniture (such as end tables, dressers, or sofas) at any of our local St. Vincent de Paul thrift stores. To schedule pickup of larger donations, please contact our Donation Department at 412-321-1071 x1. Enter your address in the locator below to find a donation box closest to you. Chances are there’s a donation box in your community, making it convenient to drop off that extra bag of donations taking up space in your closet or trunk. Your donations are critical to the support of local families in need – many who are struggling to make ends meet and rely on basic needs assistance programs provided through the Society of St. Vincent de Paul. Your clothing and shoe donation could help families like the Smiths, a family of six who has recently fallen on hard times since both parents were recently unemployed due to unexpected layoffs and illness. The family has exhausted all of their funds and can no longer cover their rent or bills let alone new clothes for their children at the start of the school year. Your donation provides much-needed clothes, shoes, and support for families like the Smiths when they need it the most. Thank you for your generosity – we can’t do this work without you!